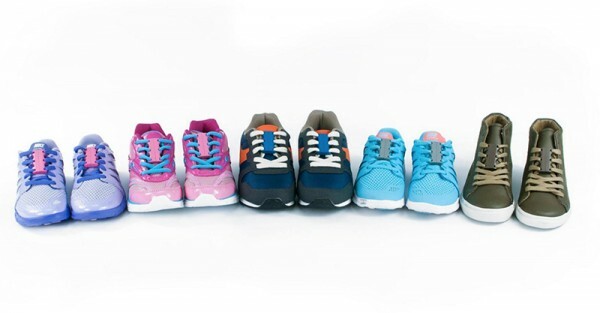 Zubits magnets lets kids tie laces faster than you can say ready, steady, go! Depending on how many pairs of shoes you’re responsible for tying in the morning, Zubits magnetic shoe closures can add back minutes to your day. Fellow efficient parents, we know you’ll see a whole universe of possibilities for how to fill that extra couple of minutes. At the top of the list might be things like eating breakfast while sitting down, or filing that jagged nail that’s been dogging you for days. Born of a Kickstarter campaign that virtually staggered under pledges, Zubits are a pair of magnets that you weave into your shoelaces once, and then voila! Zubits promises, “no more tying, no squeezing, no knots, no floppy bows, no coming undone.” Pop your foot into the wide open shoe, snap the magnets shut and away you go. Although the magnets keep laces tight and firmly in place, it’s easy to get them undone: step on your heel and pop your foot out, or give the magnets a twist. Besides the fact that Zubits make wearing shoes super easy, especially for primary school kids who have yet to master their laces, they have the added benefit of making shoes easy to store. In my house the entry is littered with shoes, but I can imagine an ingenious use of vertical space with a metal sheet and my shoes hanging from their Zubits in neat lines up the wall. Zubits come in sizes for kids from aged five to adults, priced from $28. You can buy Zubits online in a range of colours to match all your laces. At $25, shipping to Australia costs almost as much as the Zubits themselves so you may want to go in with some friends for a bulk order.